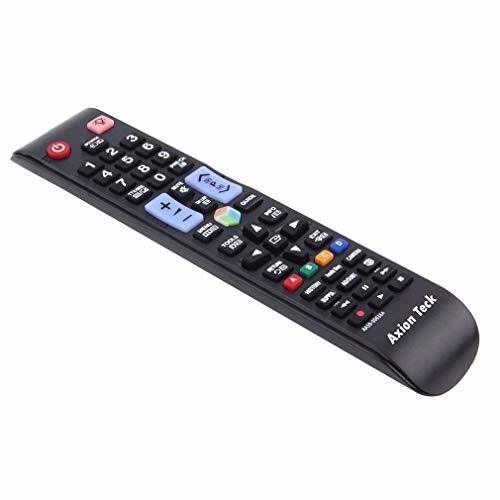 New SAMSUNG AA59-00638A Replacement Smart TV Remote Control. Product prices and availability are accurate as of 2019-04-17 07:07:55 EDT and are subject to change. Any price and availability information displayed on http://www.amazon.com/ at the time of purchase will apply to the purchase of this product. Replacement SAMSUNG AA59-00638A Smart TV Remote Control.... There is No Programming Required and it works straight out of the box for the following Samsung Smart TV models: AA59-00316B / AA59-00378A / AA59-00430A / AA59-00481A / AA59-00482A / AA59-00506A / AA59-00559A / AA59-00580A / AA59-00600A / AA59-00601A / BN59-00376B / BN59-00608A / BN59-00673A / BN59-00678B / BN59-00687A / BN59-00695A / BN59-00696A / BN59-00700A / BN59-00721A / BN59-00852A / BN59-00853A / BN59-00854A / BN59-00856A / BN5-900857A / BN59-00869A / BN59-00996A / BN59-01041A / BN59-01042A / BN59-01109A / BN59-01134A / BN5-901134B... 100% compatible and Original Layout. There is No Programming Required and it works straight out of the box. 100% compatible Replacement Samsung TV Remote control. Original Layout. If you have any questions, please feel free to contact us. Compatible for Samsung Smart TV models: AA59-00316B / AA59-00378A / AA59-00430A / AA59-00481A / AA59-00482A / AA59-00506A / AA59-00559A / AA59-00580A / AA59-00600A / AA59-00601A / BN59-00376B / BN59-00608A / BN59-00673A / BN59-00678B / BN59-00687A / BN59-00695A / BN59-00696A / BN59-00700A / BN59-00721A / BN59-00852A / BN59-00853A / BN59-00854A / BN59-00856A / BN5-900857A / BN59-00869A / BN59-00996A / BN59-01041A / BN59-01042A / BN59-01109A / BN59-01134A / BN5-901134B.